Only a cynic would claim that a film which had disappeared from view for so many years, got an airing on DVD due to the Academy Award recognition in recent years of its main star Christopher Plummer, or the resurgence in popularity of its central character Sherlock Holmes thanks to the films of ex Mr Madonna, Guy Ritchie. Instead you should accept Murder By Decree for what it is – good old-fashioned fun which harkens back to an era when films actually required a storyline and some degree of acting ability as opposed to CGI and special effects to make them memorable. The deerstalker hatted, pipe smoking detective Sherlock Holmes (Christopher Plummer), is feeling at a loose end. Rankled by the fact that the police have failed to seek his assistance in tracking down the infamous Jack The Ripper, who’s killing spree has the East End of London in a grip of terror, Holmes and his trusty sidekick Dr Watson (James Mason) take it upon themselves to find out who, or what, is responsible for the gruesome murders. What they discover is more shocking than anyone could have expected and has repercussions which could reach to the very heart of the British establishment. First let’s make it clear, if you like your Sherlock a bit Downey and Law or a la BBC, this is probably not the film for you. As mentioned there are no special effects or exotic locations and next to no crass language or overtly sexual innuendo (though considering that the story centres around the vicious murders or various ‘women of the night’ a little of the old ‘wink wink, nudge nudge’ is, I guess, inevitable). Instead this seldom seen Holmes’ outing makes the most of a strong story, which according to an explanatory note during the closing credits is based on facts discovered at the time of the film’s production which shone new light on theories surrounding the ‘Ripper’ case. And it’s this story which allows for some splendid performances from a cast which reads like a who’s who of acting legends. Besides Plummer and Mason, you have a host of luminaries which would make a casting agents eyes water, and the presence of David Hemmings, Anthony Quayle, John Gielgud, Frank Finlay, Donald Sutherland and Genevieve Bujold means that the viewer can relax in the knowledge that they are in as much for a thespian treat as for one of gruesome horror (though there’s plenty of that too). However it really is Plummer and Mason’s show and their friendly banter and camaraderie shines through. Viewed by modern audiences it will most likely be made out that there is more than mere ‘friendship’ between the two bachelors, however considering the period in which the film was made and that of that of the Sherlock Holmes’ stories, this would I suspect be a twist placed on it by present day interpretations. On the whole the film’s only downside are the sets, which for a lot of the time appear rather cardboard, with many of the scene setting long-shots clearly encompassing scaled down models. However when real sets or streets are used they are done so to great effect with plenty of pea-souper fog and horse drawn cabs racing along cobbled backstreets. There is also a fleeting glimpse of Oakley Court, without which no British made film was complete at the time, as a suitably atmospheric lunatic asylum. The awarding of a twelve rating may also seem a little out of place, as when the murders do occur the blood and gore flow perhaps a little too freely for younger audiences. 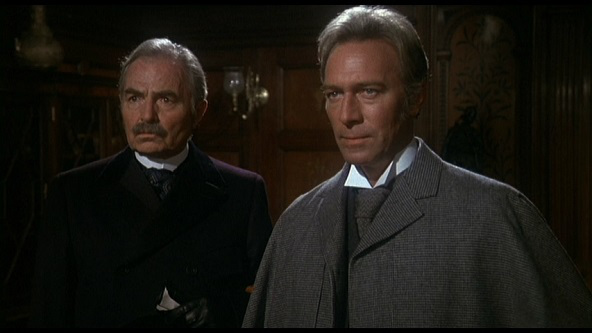 All in all however Murder By Decree is a delightful obscurity which more than holds its own against the plethora of recent Holmes adventures, and as such is well worth watching.